It’s almost that special time of year when the fish can go crazy eating olive-bodied caddis for a few days on the Yellowstone before the river blows out. It’s been a couple seasons since the stars aligned, but because of recent heavy rains that should flush the low-elevation snow and a forecast for temps in the 60s (good) rather than warmer (bad) for the next week or so, we have at least a decent shot. 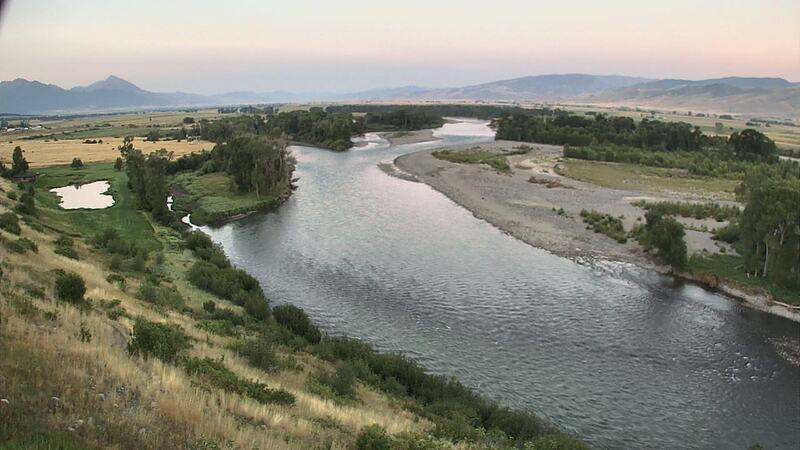 Here’s a detailed outlook, plus tactics that will work on the Yellowstone (where the hatch can be epic or can be washed out by snowmelt) and on the Madison (where the hatch is usually decent but not epic). I’d say we have a 50/50 shot at a fishable caddis hatch on the Yellowstone this year. It depends on how much it rains this upcoming week and where the snow line is. Late last week saw the warmest temps of the season, up to the low 70s at valley-level, and this combined with heavy rain yesterday (Saturday 4/20) and this morning has caused the Yellowstone to spike to 2900 to 3500 cubic feet per second flows, roughly twice the seasonal average. The river is muddy right now. Provided on how much it cools off, and it is supposed to cool off sharply Monday-Wednesday, we should have a fishable window mid-late week to get us close to the end of April. I do not expect any or at least many caddis this week. Water temps will still be in the 40s and it takes consistent 50-53 degree temps to get them really popping. Streamers are likely to be the ticket instead. The key is the period beginning next weekend, April 27 onward. Temps in the week thereafter will determine whether we get a fishable hatch. If the NOAA forecast pans out, we are in good shape. The forecast is calling for cooler than normal temps and below normal precip for this period. This would be ideal to keep runoff from starting early. We’ll see… The most likely period for the hatch will be the first week of May. After that, temps are supposed to spike and that’ll be the end of the spring fishing on the Yellowstone. The entire river from Gardiner to the mouth of the Shields River should be clear enough if the hatch does pop while the river’s clear. Even before yesterday’s rain, the river was filthy below Biltman Creek in Livingston, but the rain should have blown out most of the remaining low snow in this creek’s drainage. Once it drops, this will open up more clear water. It is unlikely the Shields River will clear enough to make the area east/downstream of its confluence fishable again this spring. There’s too much snow in the Shields Drainage, which is south-facing and therefore melts quick. Over on the Madison, expect the caddis to pop in mid-May. While seldom as epic as the Yellowstone hatches, the Madison hatches pretty typically offer at least decent fishing for a week or more in mid-May. Subsurface tactics are usually more effective during the Mother’s Day Caddis hatch than dry flies, and attractor dry flies are usually more effective than imitative ones. Start your day of fishing with streamers or by nymphing deep. 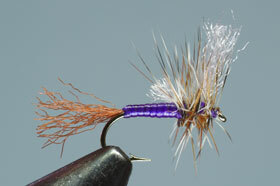 Flashy streamers like the Kreelex are good choices in the spring as the water gets dirty. 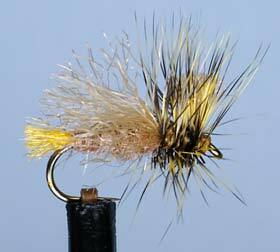 Run a caddis pupa like my Mother’s Day Pupa as a second chance fly behind this streamer. A lot of fish will take the dropper if the caddis hatch is imminent. If nymphing, something like a Prince or my Hula Princess on the bottom with an upper dropper of a lighter caddis pupa is a good choice. Another option is to fish a stonefly nymph with the Prince or a heavier pupa behind it. Once you start seeing a few rises and a few caddis fluttering, switch to something like a #14 Peacock Clacka Caddis or Coachman Trude with the Mother’s Day Pupa or Prince on the dropper. Except in intense hatches, you can stick with this rig for the remainder of the hatch. Look for hatches to be heaviest from early afternoon through early evening. Early and late in the day won’t do much for you. If the fish really start going crazy, swap the pupa for an olive Mercer’s Missing Link Caddis or Lawson’s Spent Partridge Caddis in olive. These double-dry tactics will work best in areas where bugs will cluster: foam patches, large eddies, and the like. They’re also a better bet if you’re wade-fishing than floating, since when wading you can pound areas you find rising trout and sort of encourage them to rise. From the boat, you’re flock-shooting and so better off most of the time targeting the larger numbers of fish eating pupae subsurface. While giving fly tying demonstrations over the weekend at the Wasatch Fly Tying and Fly Fishing Expo in Salt Lake City, I mentioned to several people observing me tie that I almost always fish imitations of insects that are in some way impaired. What do I mean? I am referring to flies imitating or at least suggesting aquatic insects that are emerging, crippled, spent, drowned, or waterlogged, or of any terrestrial insects that fall in the water (since land insects in the water are by their nature in trouble). Here are five reasons to fish flies meeting one of the above criteria. This is the most obvious and important reason to use such flies. Various studies on trout feeding behavior find that they prefer to feed on insects during their life stages in which they’re in trouble, or on individual insects that are experiencing difficulty. For example, they’ll emerging or crippled insects in preference to adults, and they’ll eat dun mayflies that have been knocked over in preference to those riding “like little sailboats” upright, as they’re often described. The reason trout prefer insects that are in trouble is simple. They’re less likely to get away. Each time a trout rises to eat an insect and it flies away, that’s a calorie the trout has wasted. Over evolutionary timescales, it has made more sense for fish to key on bugs that are less likely to get away and more likely to prove an easy meal. The smaller the insects, the more important this is. So trout really prefer spent, crippled, emerging, or otherwise distressed ants, PMD, BWO, midges, and tiny caddis over their healthy brethren. This is a more esoteric reason. Look at a healthy dun mayfly. It rides up on its tippy-toes, above rather than in the surface film. Many flies were nominally designed to match this behavior. 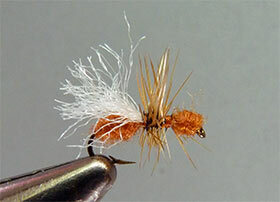 The classic Catskill-style mayfly dry is a perfect example. Drop it dry on a glass of water and it’ll ride high, just like the real bug. Yet in fishing situations, no fly pattern will ride as high as healthy naturals, at least not for long. All flies get waterlogged, ragged, chewed-on, and otherwise stop looking like they do in the fly shop display within minutes or seconds of being tied on the end of your line. In other words, they start looking and behaving more like distressed insects, no matter what you do. This partially explains the common phenomenon of a fly working better the more beat-up it gets. If your fly is going to look and act distressed anyway, why not emphasize these attributes, rather than trying to minimize them? This caddis cripple pattern uses three materials (in addition to thread and hook): dubbing, a synthetic yarn, and hackle. When tied to match the important Nectopsyche caddis on the Firehole, it’s my #2 dry on that river. When tied in tan, it imitates both emerging and egg-laying tan Hydropsyche caddis, the most important summer caddis in the entire region. In pink, it’s a great attractor for bright summer days on the Yellowstone. This attractor suggestive of a mayfly cripple uses five materials: a synthetic yarn for the tail, spandex for the body, a different synthetic yarn for the wing, and two colors of hackle (Adams-style). Since both bunches of synthetic yarn or tied in as clumps and then trimmed to shape, this is a much faster fly to tie than the original Purple Haze Parachute on which it’s based. It’s also three times as effective. It has been our top dry fly period since the fall of 2009. This is our top-producing terrestrial pattern most seasons. It uses three materials: acrylic yarn chopped into dubbing in a coffee grinder, synthetic yarn, and a brown hackle. We use these everywhere, from little mountain creeks to the roaring Yellowstone. I can whip one out in about two minutes. I went a little long in this point, but it’ll tie in with my next post on the subject (expect it around April 20-22), which will be about designing and tying patterns that match impaired bugs. Think about the dry flies that fill fly shop bins, especially those considered classics and standbys. They’re generally bushier and more complicated. This applies to everything from mayfly imitations and attractors suggestive of mayflies (Adams, Royal Wulff) to caddis (Elk Hair Caddis) to stoneflies (big foam monstrosities and Stimulators) to terrestrials (big complicated foam hoppers and most ants). These flies generally aim to suggest healthy dun or adult aquatic insects and terrestrials that haven’t started to succumb to their unplanned swim. While it doesn’t matter on lightly-pressured waters, opting to suggest something else will earn you more confident strikes and more fish. As noted briefly above, my next post will cover tips on how to create flies that match impaired insects. Gibbon River System above Virginia Cascades upstream to Wolf Lake and Grebe Lake: These waters were poisoned in 2017-2018 for a planned westslope cutthroat trout and fluvial (stream-dwelling) Arctic grayling reintroduction. As such they’re fishless for the moment, but in 3-5 years should be good again. This is part 1 of a series of posts I’ll make through the season about “oddball” fisheries. I’m not going to reveal any hidden gems or tell you which rock to stand on, but I do intend to mention some fisheries “in the margins,” that might be fun for some PFS customers for an hour or two. Some of these fisheries will be in the park. Some will be quite far abroad in Montana. Enjoy! The marsh through which Swan Lake drains into Glen Creek is located east of the Mammoth-Norris Road immediately south of Rustic Falls. This fishery is swampy, difficult to get around in due to sucking mud and sudden deep holes, provides perfect habitat for mosquitoes though not for trout, and is often crowded with hikers and bikers using the dirt Bunsen Peak Loop Road, one of the few trails in Yellowstone Park where bikes are permitted. So why fish here? That’s simple: it’s one of only two options near Mammoth where trout can always be caught during the first week or two of the Yellowstone Park season (the other is Joffee Lake). I’ve had clients catch fish here in the last few days of May while standing on snowbanks. The Swan Lake Flat sloughs begin at Swan Lake’s outlet. During the peak snowmelt from mid-May through mid-June, the lake drains via a seasonal stream from its northwest end. This outflow passes under the road in a culvert, then arcs in a crescent first northeast, then northwest to join Glen Creek adjacent to the Bunsen Peak Trailhead immediately south of Rustic Falls (on Glen Creek). This marshy outflow forms ponds (almost all associated with spring seeps) connected by narrow, deep channels. In late summer and fall, the meadow adjacent to these channels is dry, but in early June the entire area is a marsh filled with ankle- to thigh-deep water and sucking mud. Because the fish in this series of ponds and channels come from Glen Creek, the lower holes typically have larger fish numbers. That said, after a couple good water years when the ponds don’t get too warm and the marsh doesn’t dry up, fishable numbers of small to moderate-sized brook trout can be found almost all the way to Swan Lake. The areas where higher ground gets closest to the larger pools offer easier access. The larger holes, which usually host beavers and muskrats, require a long slog through deep water, grass, and mud. I guide here once or twice almost every year, always before the middle of June when there are few other options. This is not a numbers fishery, but it is a fishery, and places to fish are hard to come by in the northern part of Yellowstone Park in early June. Because this is flat, clear water, the brook trout here (which run five to twelve inches) are spooky. When guiding beginners, I usually have them fish a midge pupa and a soft hackle under a tiny indicator, without additional weight, then have them cast these rigs out along the deeper weed lines. Every fifteen or thirty seconds, I have them give their lines a slight twitch. This isn’t quite worm and bobber fishing, but it’s close. This is about the only way beginners will succeed here, since otherwise they can’t reach out far enough to avoid slapping the water and spooking the fish. When guiding more experienced clients, I have them use similar flies most of the time, but will have them either look for the occasional rise to cover or cast as far as they can and retrieve their flies with a slow hand twist retrieve. Brook trout streamers like the Joffee Jewel or traditional Mickey Finn can also work with this tactic, especially right at the start of the season, before any insects are active. When the bugs are active, usually midges (and mosquitoes), a tiny Adams Parachute or #16 Coachman Trude with an even smaller midge pupa under it will draw some rises. All in all, this water is a good diversion for a couple hours, if there’s no time to drive down to one of the Madison Drainage rivers that are also fishable at this time. The easiest access and the only one that receives appreciable fishing pressure is the Bunsen Peak Trailhead just south of Rustic Falls. The northernmost pool is right next to the trailhead. Otherwise, use one of the pullouts further south towards Swan Lake itself and walk (slog) to the creek. Beware of critters: mosquitoes, bears, and calving elk. A cow elk once followed me all the way back to the car here, after I must have gotten too close to her calf. Also be careful slogging through the marsh, and avoid wearing clothes you don’t want to get dirty. Odds are you’ll wind up eating it if you squelch too far out. While the late June and July PMD fishing gets most of the love, to say nothing of bookings 18 months or more in advance, I actually prefer the spring fishing. The fish are coming off a long winter in which they saw far less pressure than they do in the summer and early fall, there’s lot of “country cousin” rainbows that run in from the Yellowstone to spawn, and the mayflies are starting to get active with warming weather and water. Mid-March is prime time. Angling pressure begins to rise in March, since the weather at valley level can often be quite comfortable at this time, but the overall pressure through the winter is low. This means that the resident trout in the spring creeks are not quite so intelligent at this time as they are in the summer, when the creeks are fully booked most days. This helps mean the trout can be caught on flies that aren’t quite so tiny and precise. Even more important in making mid-March a good time on the creeks is the heavy run of spring-spawning rainbows that enter the creeks at this time. Trout begin entering in January or February, but the numbers are highest from mid-March through early April. Many of the fish are not yet spawning in March, which makes them more available than they are in April, since it’s not ethical to target actively spawning trout. It’s fine to do so when they’re still in the pre-spawn stage in deeper water, however. These fish are important not only in cranking up the fish populations in the streams, but in providing food both for resident trout and the other running trout. They do this in two ways. The first and most obvious is in egg production. Eggs that drift helplessly in the current are not viable (they must be safely buried under fine gravel to hatch) and are as complete and easy a meal as a trout can find. There’s a reason fishing in Alaska is centered on eggs. It doesn’t quite center on eggs on the creeks in March, but they are important. In addition to these failed products of the spawn themselves, prey items stirred up and swept into the drift makes for easy prey for trout clustered downstream. These prey items include all of the bugs and critters that live in the creeks, but center on the items most active in spring: Baetis (BWO) mayfly nymphs, midge larvae and pupae, and aquatic worms. While some combination of egg patterns, BWO nymphs, subsurface midges, and aquatic (skinny San Juan) worms will produce the biggest numbers of fish, mid-March can also produce excellent dry fly fishing during the year’s first consistent hatches. Midge hatches can occur even in the dead of winter, but they are fragmentary and don’t pop every day. By mid-March, these midge hatches intensify and are joined by consistent Blue-winged Olive emergences. While the clockwork hatches of early summer are seldom found in March, if you hunt for them you can find rising fish most days in March. The hatches will be best on calm days with at least some cloud cover, particularly when temperatures are in the 40s-50s. Look for days at the tail end of warm spells, just as a front starts to roll in. Your enemy here will be wind, but during calm spells expect to see some noses. I’ve mentioned many of the prey items it’s important to match in mid-March above. Here is how you should aim to fish these bugs. Focus your efforts on the deeper runs and pools downstream either of shallow riffles (where the spawning activity will be taking place) or downstream of migration barriers such as culverts or the small dam on the pond at Depuy Spring Creek. Even shallow riffles can serve as migration barriers, since fish that aren’t yet in the throes of passion will be hesitant to swim through such areas on their migrations (due to exposure to predators) during daylight hours. Nymphing is the primary tactic in these areas. Combine a pair of the food items noted above. If downstream of spawning fish, I’ll certainly use an egg first. If downstream of rough or turbulent water such as a culvert, I’ll probably opt for a slender San Juan Worm with a mayfly or midge, at least for starters. Both indicator and Euro-style nymphing tactics can work in these areas. The smaller the target, the more likely I’ll pull off the indicator and try to stay in contact with my nymphs. Make sure you are using enough weight that your flies are ticking bottom. Both weighted flies and weight added to your leader will work fine. With nymphs, cover the water thoroughly and slowly. I like to move fast when I fish, but when nymphing the spring creeks I’ll often stick to one run for an hour or more. A secondary tactic is streamer fishing. Fish a medium-sized Woolly Bugger or other generic streamer. Use either a heavily weighted fly and a normal leader or a lightly weighted fly and a medium-sink Polyleader. There’s no need for an aggressive sinking line on the spring creeks. Always keep an eye out for rising fish, especially from about noon until 3:00. The best chances for hatches will be in the walking-speed slicks running about waist-deep, the sorts of areas that are too deep and perhaps slow for spawning activity but shallower than the best nymphing runs. Don’t bother fishing dry flies unless you see fish rising. DO NOT FISH FOR ACTIVELY SPAWNING TROUT!!! These fish will be found in water less than about two feet deep, primarily over gravel bottoms that the trout have “cleaned” of silt and algae using tail and body motions. These areas, spawning nests known as redds, will look paler than other areas, and will often feature dish-shaped depressions ranging in size from a garbage can lid on up to a large dining room table. Often multiple redds are packed next to one another. Active spawners on redds will often be easily visible and look to be chasing one another. They are often large, and so tempting targets for many anglers. Don’t do it. Every trout in the Paradise Valley spring creeks is wild, and fishing for them while they’re doing the deed both disturbs their spawning activity (how would you react if disturbed while YOU were “spawning?”) and can potentially kill eggs, for example if you wade through unnoticed redds to get in position to cast to spawning trout. Rod: 9′ five-weights are the bread and butter stick at this time, because they are suitable for any likely tactic. Reel: Use your basic trout reel. No need for anything fancy on the creeks, because the fish seldom run long distances. Line: DT or WF to match your rod. While summer dry fly fishing is easiest with a line marketed as “precision” or “delicate,” such specialization is unnecessary at this time. Leader: When fishing dries and nymphs, I almost always start with a 9′ 4X leader at this time, though I’ll often add 18″ of tippet to a standard leader for more delicacy and a faster sink rate with nymphs. If using streamers, go with either a 9′ 3X leader or a Polyleader with 3X tippet. Tippet: 4X can sometimes cut it with nymphs on the creeks in the spring, but 5X and 6X are typically more useful for nymphs and especially for dries. 3X is fine with streamers. I always use fluorocarbon tippets (though standard nylon base leaders) on the creeks. Special Tools: Your normal fishing tools such as nippers, forceps/barb-mashers, etc. Also throw in a pair of “cheaters” if your eyes aren’t what they once were, since though the flies are bigger than they will be later in the year, spring creek flies are always small. I mentioned the basic food items you might expect to use on the spring creeks in March above. The following list covers some specific patterns I like, that cover all the bases. Pink Y2K Egg, #16 (note: this is a nonstandard tie of this “standard” pattern, but it’s an easy one. Simply Google the original fly and tie it small and pink).